We get this question ALL the time. Which tent is “better” is about personal preference and budget. Frame and Pole tents differ not only in price but in structure. 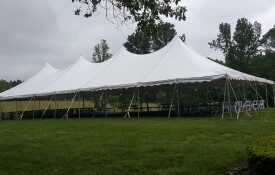 Both tents have 8ft tall perimeter poles (the size and make of tent determines spacing between these perimeter poles but they can range from 10ft to 15ft to 20ft). 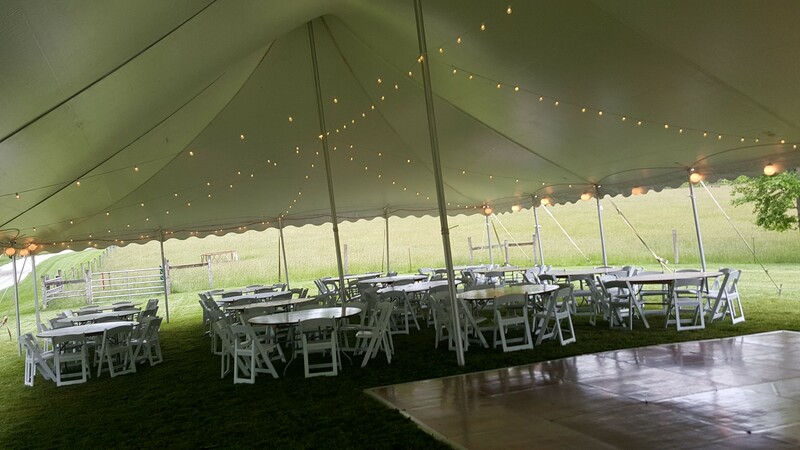 Pole tents have not only the perimeter poles but they also have large poles running through the center of the tent every 20ft. Th ese giant poles hold up the tent top. 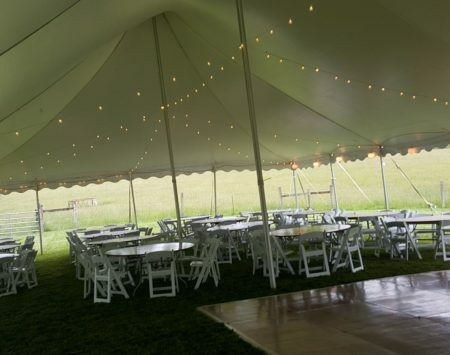 From the outside, this is what gives this tent the swoop effect that so many brides love. Pole tents have many more perimeter poles and therefore many more stakes. As such, grass that can be staked in is the preferable surface. Pole tents MUST use stakes to secure (they can not be water barreled or dead weighted with concrete blocks). Pole tents are easier to put up/take down and are less expensive than their Frame counterparts. 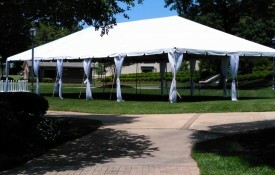 Pole tents usually require a minimum of a 10ft perimeter around the tent for proper build/installation. Frame tents have a roof like structure built with tent poles that holds up the tent top. These are the preferable tents for long term installations as they have a higher wind tolerance. 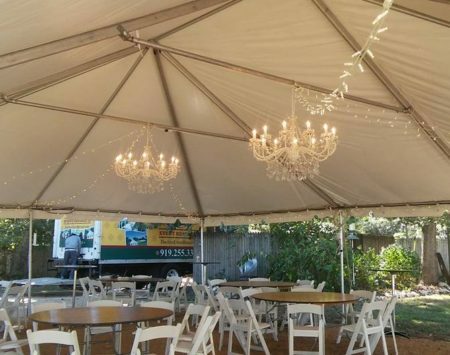 Frame tents do not have any poles in the center of the tent freeing up square footage for unobstructed layouts. 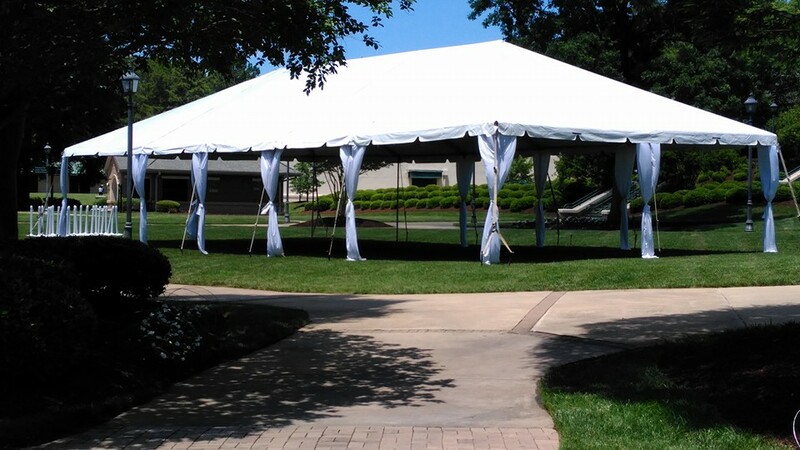 Frame tents can be staked in the grass or asphalt (with drilling to stake and patching when we leave) but also on surfaces like concrete (or other non stakeable surfaces) using water barrels. For a concrete space that will take a tent on a regular basis, we can install concrete lugs that are sunken into the concrete and from which we can tie off to when installing the tent alleviating the costs of using water barrels to secure the tent.